In 1838 Juan Pablo Duarte founded a secret society called La Trinitaria, which sought the complete independence of Santo Domingo without any foreign intervention. Ramón Matías Mella and Francisco del Rosario Sánchez, despite not being among the founding members of La Trinitaria, were decisive in the fight for independence. Duarte and they are the three Founding Fathers of the Dominican Republic. On February 27, 1844, the Trinitarios (Trinitarians), declared the independence from Haiti. They were backed by Pedro Santana, a wealthy cattle rancher from El Seibo, who became general of the army of the nascent Republic. The Dominican Republic's first Constitution was adopted on November 6, 1844, and was modeled after the United States Constitution. The decades that followed were filled with tyranny, factionalism, economic difficulties, rapid changes of government, and exile for political opponents. Threatening the nation's independence were renewed Haitian invasions occurring in 1844, 1845–49, 1849–55, and 1855-56. For the next 22 years the whole island of Hispaniola was under Haitian control - Dominicans call the period "The Haitian Occupation". Due to their loss of political and economic control, the the former Spanish ruling class deeply resented the occupation . During the late 1830's, an underground resistance group, La Trinitaria, was organized under the leadership of Juan Pablo Duarte. After multiple attacks on the Haitian army, and because of internal discord among the Haitians, the Haitians eventually retreated. 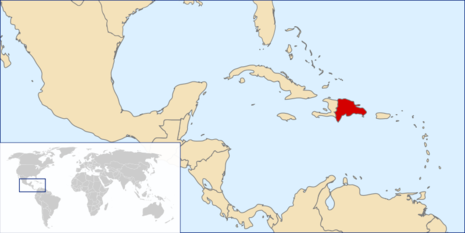 Independence of the eastern two-thirds of Hispaniola was officially declared on February 27, 1844, and the name República Dominicana (Dominican Republic) was adopted.